The Amusgo people span the states of Oaxaca and Guerrero in the mountain region of the Costa Chica between Puerto Escondido and Acapulco. They are back-strap loom weavers of an extraordinary garment called the huipil. This particular textile is fine gauze cotton, a loose weave, to offer comfort to the hot, humid climate. Even in winter, a light-weight covering is preferred. Our group of eleven travelers made our way up the coast over a six-day period to explore the textile villages of the region. Xochistlahuaca was our northernmost destination. I have known about this cooperative Flor de Xochistlahuaca for years. They participated in Oaxaca City expoventas at the Museo Textil de Oaxaca, and at the Santa Fe International Folk Art Market. Social entrepreneurs and textile consultants Ana Paula Fuentes and Maddalena Forcella worked with the cooperative, too, to help them develop marketing, promotion and economic development plans. When we arrive, the director Yessie greeted us warmly and introduced us to many of the 39 cooperative members who were there to meet us. They range in age from young adults to aging grandmothers. They are talented spinners and weavers, and their design and color sensibility is unparalleled. What was remarkable about this visit is that we sat opposite each other, face to face, gave self-introductions, and had an opportunity to learn about the role and life of women in the village and our experience as women living in the USA and Canada. I encourage our travelers to think of ourselves as amateur cultural anthropologist, to ask the people we meet about what they love about their work and home life. They are curious about us and we answer their questions. We are curious about them, the challenges they face, the dreams they have for their children, and what they want to improve quality of life. We are there to learn, listen, understand, share and also support by buying direct from the makers. We tell them our ages and where we are from. We share our marital status: widowed, married, divorced, always single. We learn that collectively we are similar. One woman says she never married because she didn’t want a husband directing her life and taking her money. Among our group are weavers, dyers, sewers, collectors, teachers, writers, lovers of beautiful cloth. They are culture-keepers who spend days taking care of family, cleaning, cooking, shopping, doing laundry. The cooperative gives them the freedom to weave uninterrupted several days a week and get away from the responsibilities of taking care of others. Women rotate being there. They say it gives them a sense of independence and camaraderie. Over lunch at a local comedor we talk about life differences and similarities. Some say it appears that village life is more simple and we dig deeper into what that means. I think it is more basic but it is not more simple. As foreigners living in the frenzy of post-industrial, consumer-based, technology-focused environments, we have a tendency to romanticize what many call a simpler lifestyle. Many of us yearn for that. Women’s lives are complex whether we live in Xochistlahuaca, Guerrero, or Chicago, Illinois. We worry about our children, their education, health care, whether there is enough money for essentials and extras. We work at home or outside the home or both. Maybe we have aging parents who need care or an alcoholic or abusive spouse, or a child with special needs. We have dreams that may never be realized. As we travel through the textile world of Oaxaca, doors open to us to connect and understand, offering a richer travel experience. Let me know if you would like to travel with us on a January 2020 Oaxaca Coast Textile Study Tour. Send me an email. I will only offer this trip if there are 6 people ready to make a $500 deposit to secure a reservation. Only another hour to go! Asbestos Health Risk for La Flor de Xochistlahuaca Weaving Cooperative. How You Can Help! 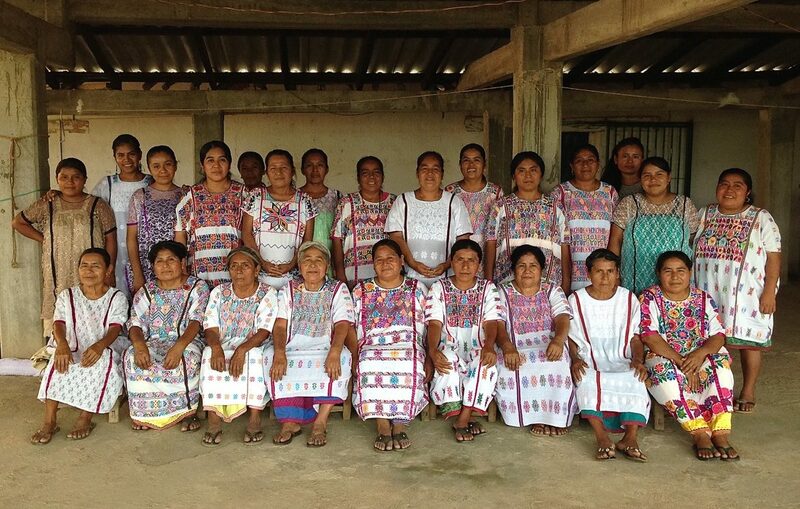 I am writing to ask you to consider making a gift of whatever size to remove the toxic, cancer-causing asbestos from La Flor de Xochistlahuaca women’s weaving cooperative work space in Guerrero, Mexico. On the webpage it explains everything: the roof of asbestos that needs to be destroyed and rebuilt because it is very toxic and a carcinogen and operates like an oven creating uncomfortable working conditions in the extreme heat. In addition, there is a great video about the cooperative and the weavers and the gifts that will be given with each donation. Please take a look. The goal is ambitious and we need the help from all of our friends – especially those textile lovers and those interested in artisan craftsmanship. I know most of us don’t like to receive petitions for money, but in this case, I know that it is worth it. And, I know that I owe it to the weavers, to their hope for a better future and for their wish to have a work space that is healthy and dignified for the excellence of their textile art. I ask you to please consider participating. Thank you again for your support and time, I really appreciate it. Norma’s Note: Maddalena has worked with this group for three years to build their economic development and marketing capacity; this is her last project with them. They live on the border between the states of Oaxaca and Guerrero. Their handmade weaving work is exquisite, and their health matters! Please support them with whatever size gift you can afford. En la página se explica todo, el techo de lámina de asbesto, que debe ser cambiado ya que es super tóxico y cancerígeno, ademas de ser un horno cuando se esta debajo, también hay un bonito video y fotos de la cooperativa y de las tejedoras, y los regalos que las artesanas enviarán a los donadores.